Common lizards kept in captivity include the Bearded Dragon, Leopard Gecko, Fat-tailed Gecko, Anole, Water Dragon, Common Green Iguana, Chameleon, Blue Tongued Skink, Savannah Monitor and Uromastyx. Care of any lizard is specialized. Reptiles are ectotherms (cold blooded), dependent on environmental temperature to regulate their body temperature. It is important to research a species in order to provide the proper environment and care it requires. An enclosure should mimic the natural environment in which the lizard normally lives. It should be easy to clean, well ventilated, properly lighted, heated and escape proof. A glass or plastic aquarium or terrarium with a tightly fitting lid or a specially designed enclosure with latched sliding front doors is preferred. The environment must be large enough to allow the lizard room to stretch out and move freely. Lizards rely on the environmental temperature to regulate their body temperature. Increasing and lowering body temperature helps to digest food, grow, fight disease and reproduce. The optimum ambient temperature and a thermal gradient (hotter and cooler spots) must be provided to maximize the lizard’s health. Each species has a preferred optimum temperature zone or range (POTZ/POTR) in which its body systems work most efficiently. If kept higher or lower than the POTZ, medical problems will result from the continual stress the lizard is experiencing. In their natural habitat, many reptiles deal with temperature extremes by sleeping through the hottest part of the day, burrowing underground where the temperature is less affected by the conditions, or by partially hibernating (aestivate in summer or brumate in winter) to conserve their body fluids and energy. In a captive situation, the reptile’s options are considerably reduced within the confines of an enclosure, as gradients and microclimates are more difficult to achieve. As a result, several items must be purchased to set up an adequate enclosure for a pet lizard. Heat sources such as heat lamps, heating pads or heating tape are preferred. Choose ceramic heat bulbs, as white or red light can interrupt the lizard's sleep patterns. Heat sources should be continually available, with a primary heat source creating the preferred ambient temperature and a secondary heat source creating a basking area. Both day and night gradients should include a basking (or warmer) area where a microclimate with increased heat is provided. Bulbs should be secured in such a way as to ensure the lizard cannot come into direct contact with them. Heat rocks are never recommended, as they are poor radiators of heat and direct contact with the hot surface temperature leads to thermal burns. Thermometers are essential tools with which to measure heat in the enclosure. Multiple thermometers or a digital thermometer gun allows quick assessment of the ambient and basking temperatures. Temperatures should be checked daily to catch system failures or fluctuations that may adversely affect the animal. Lizards have a less defined requirement for humidity gradients, but all species require at least a small microclimate of humidity to aid in shedding and defecating. Overall tank humidity can be provided in varying degrees via open water dishes, spraying or misting the tank, or with foggers, misters or drip bottles for lizards requiring high humidity. Lizards from drier climates seek humid spots in burrows or under rocks. A plastic container filled with sphagnum or peat moss set over an under tank heater and misted frequently mimics this. Humid or shed boxes should be cleaned weekly and always checked to ensure they are warm and moist not cold and damp. Measure humidity regularly with a hygrometer. Lizards requiring high humidity can be challenging to keep in dry climates. A fine balance must be found between sufficient humidity and heat and adequate ventilation to prevent fungus and mould from growing. Substrate should be safe and easy to clean. For a simple and easy to clean substrate, newspaper, astroturf® or a reptile turf or felt make good choices. When using turf, ensure that the edges do not fray, and change and clean the turf regularly to prevent mold and fungus from growing underneath it. Cutting two pieces for the tank allows quick replacement while cleaning and drying the removed piece. If housing a burrowing lizard, avoid corncob, kitty litter, wood shavings, dirt or gravel as these can be swallowed and cause impaction and also promote bacterial or fungal growths in the enclosure. Substrates such as sterile sphagnum moss, cypress or fir barks or are preferred and should be at least 2-4 inches in depth. Although many lizards are desert dwelling, an all sand substrate predisposes the lizard to gut impaction and is not recommended. Always provide at least one hide area so the lizard can safely get out of public viewing. In a natural setting, many lizards hide under rocks, leaf debris, or in shallow burrows to escape both being seen and to avoid extreme temperatures of the day. Hides should be made of an easy to clean material and large enough to fit the entire animal, yet snug enough to provide security. Provide branches and logs for arboreal and semi-arboreal species (tree dwellers), avoiding forked branches that could potentially trap the lizard. UVB lighting should be provided for all lizard species. Logically, sunlight, whether direct or filtered, will contact a lizard’s body in a day, providing the necessary Vitamin D3 needed to help absorb calcium in the body. Natural sunlight produces healthy bones, stimulates the appetite and immune system and can enhance the colour nuances of the body. Sunlight through a glass window or plastic lid actually filters out the UVB rays removing any benefit. Lights should include both the UVA and UVB spectrum. The light should be placed above the tank at an optimum of 18 - 24 inches from the reptile. Most ultraviolet lights (other than the mercury vapour bulb) do not produce significant heat and should not be considered a source of primary heat. Ultraviolet lighting should be changed regularly, according to manufacture recommendations. Cleaning and disinfecting should be done on a regular basis. Droppings should be removed immediately and complete cage cleaning should follow a schedule appropriate to the size of the tank. Keeping loose substrate in shallow containers allows for easier removal. Without the wind, sun and rain to naturally clean the substrate in which the lizard lives, regular cleaning is the only defense against bacteria, fungus and mould building up in a reptile’s tank. When cleaning, do not use products such as Lysol®, PineSol®, or Dettol® as these are poisonous to reptiles. A dilute bleach and water solution, or a formulated disinfectant such as Virkon® are safe. Rinse well and ensure there are no residual fumes. Quarantine any new reptile entering the home. Deadly viral and fungal diseases are not only transmitted by direct lizard-to-lizard contact, but can be transmitted through the air or via vectors (objects that carry the agent causing the disease). Depending on the species in the collection and the species being added, quarantine should range from one to several months and quarantined animals should always be fed, cleaned and handled last. Depending on the species and stage of life, lizards can be insectivores, herbivores, carnivores or a combination of the above. Many lizards will eat differently when young than as an adult. Without the availability and variety of nature’s buffet, captive lizards often suffer nutritional deficiencies leading to serious problems such as metabolic bone disease, fatty liver syndromes and vitamin deficiencies. Insect Diets: Staple insects include crickets, dubia roaches and horn worms. Insects that should be given occasionally include butter-, meal-, phoenix-, silk-, super- and wax worms. Insects to be avoided include fireflies (toxic to bearded dragons). Seasonally caught wild insects such as moths, earthworms, fruit flies, flies, grasshoppers, bees (remove stingers) can be offered as long as they are free of insecticides. Insects are inherently high in phosphorous and low in calcium, so both gut-loading and dusting the insects before feeding is recommended. Because gut-loading varies in its consistency, a daily calcium supplement is recommended. Calcium should be without phosphorous and without Vitamin D as long as the UVB light is present. To dust the insects, place them in a bag with the calcium powder and allow them to become coated. Insects will groom the powder off quickly, so only dust those the reptile will immediately eat. Further supplementation with a multivitamin and mineral supplement can be be used weekly. Carnivore Diets: Lizards that eat whole prey ingest a much more balanced form of nutrition. Frozen rodents, gently thawed (place in a plastic bag in warm water) provide a convenient method of feeding. Many carnivorous lizards begin life eating insects and graduate to whole prey as they grow. Understanding the natural history of the lizard kept allows for correct choices of prey. Herbivore Diets: Lizards on herbivore diets often suffer nutritional deficiencies in calcium and protein. Many lizards will eat both insects and items from the herbivore list. The insect to vegetable matter ratio will vary depending on the age and reproductive status of the lizard. Routinely fed vegetables include dark leafy greens such as collard and mustard greens, kale, endive, escarole, dandelion greens, bok choy and watercress. Spinach and cabbages can be fed, but less frequently. Routine vegetables include orange and yellow coloured squashes, green beans, sweet potatoes and snap peas. Edible weeds and flowers include dandelion, nasturtium, hibiscus and clover. Fruits are fed for colour and moisture and can include berries, mango and melons. Adding softened alfalfa pellets or using an alfalfa powder (found in health food stores) provides both calcium and protein to the diet. Both avocado and rhubarb are toxic and should not be fed and citrus fruits should be avoided. 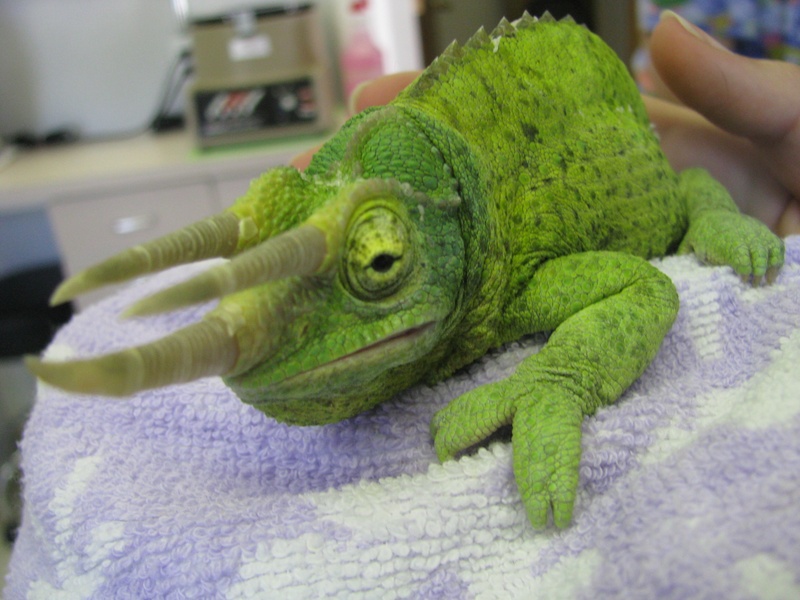 Calcium supplementation is recommended with herbivore diets and should be used daily in young, sick or breeding lizards and every 4-5 days in non-breeding adults. A multivitamin and mineral supplement can be used once every 7 – 10 days. Water: Water should be available to all lizards, regardless of species, daily. A larger water dish helps create humidity and provides a pool in which the lizard can soak. Many lizards do not drink from standing water bowls, but rather, lap small droplets from items in the enclosure, so mist the food and the walls in the enclosure frequently. In species where excess humidity is harmful and water intake is minimal, a smaller water dish placed in the cage for part of the day will be adequate. A newly purchased lizard should be allowed a minimum of two weeks to acclimatize to its new environment and should have fed several times before handled daily, after which, handling 10-15 minutes a day can help adapt the lizard to human touch and allows a quick exam of your pet to look for any abnormalities. Excess time out of its environment cools the body temperature of the lizard and causes stress. 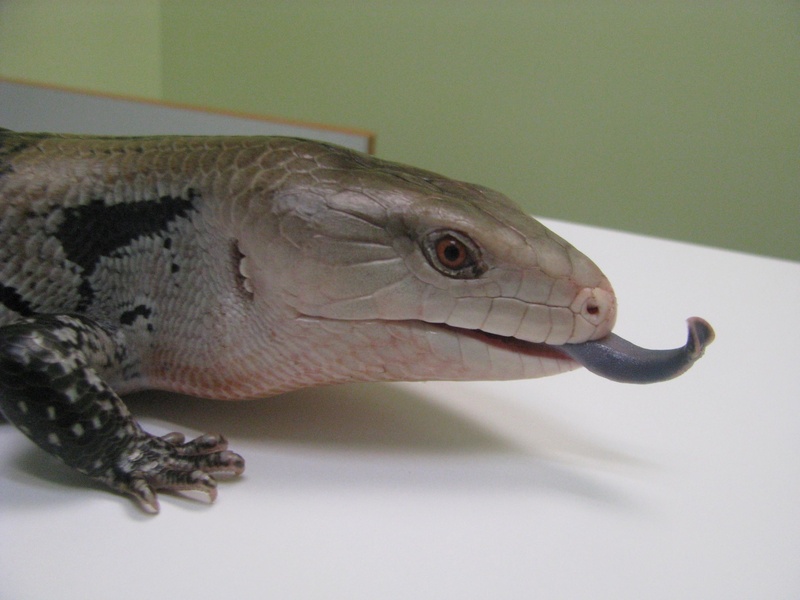 Avoid handling after feeding to prevent regurgitation and do not handle lizards during a shed to prevent scale damage and respect the stressful process of shedding. Many lizards will drop their tail if threatened or stressed, a natural defense mechanism in the wild. Young children should always be supervised when handling a lizard and careful hygiene should be practiced. (See our handout on Salmonella). Dysecdysis: Several factors, including humidity, nutrition and general overall health, can result in an incomplete shed. Retained pieces of skin can prevent proper growth, constrict toes and feet and retained eye caps can lead to eye infections. Consult a veterinarian if your lizard has trouble shedding. Impaction: Trouble defecating can be a result of foreign material collected in the digestive tract, constipation, inappropriate feeding, inadequate heat or humidity, or bacterial or viral infection. 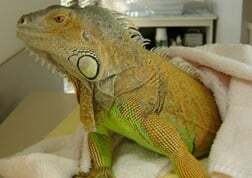 Retained feces can make a lizard seriously ill and any lizard not defecating regularly should be seen by a veterinarian. Parasites: Lizards can be affected by internal and external parasites. Routine examination of a stool sample followed by appropriate treatment is recommended. Egg binding: Lizards do not need to be mated to produce eggs. Although infertile, the eggs still need to be laid and the same stresses of forming and then laying the eggs occur in a non-breeding lizard. Difficulty laying eggs is called egg binding. This is a life-threatening event and veterinary care should be immediate. 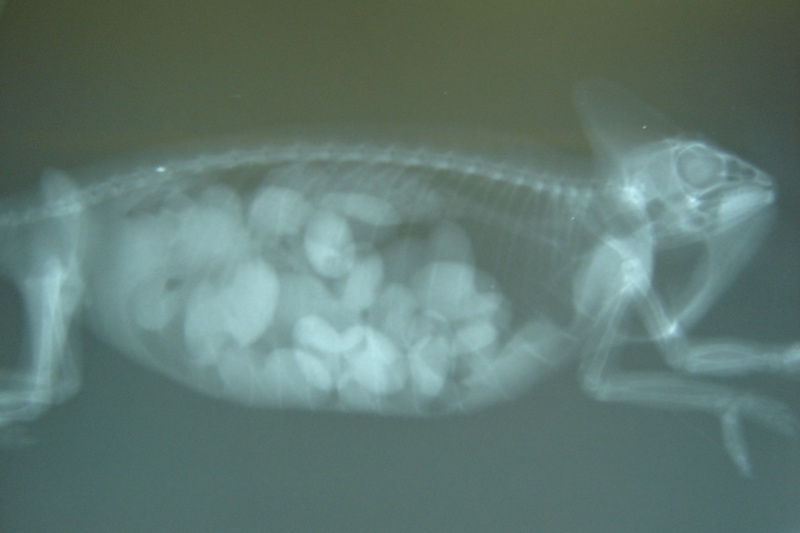 Metabolic Bone Disease: Calcium deficiency is common in young growing lizards fed and housed inappropriately. Clinical signs include anorexia, stunting, sprawl, inability to lift the body and tail while walking, softened jawbones, curvature of the spine, thickening of the limbs and tremors. Treatment is aggressive and skeletal deformities may be permanent. 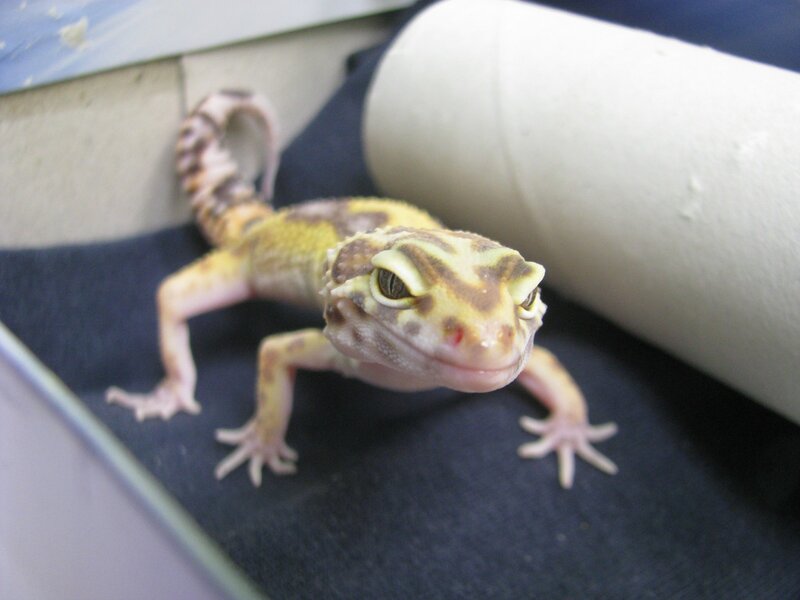 Yellow Fungus disease: The fungal organism Nannizziopsis causes a rapidly fatal contagious skin disease in many reptiles, but especially bearded dragons. Known as yellow fungal disease lesions appear yellow to yellow brown with thickening and ulceration and can spread internally to the lung, liver, spleen and coelomic fat pads. Yellow fungus disease is difficult to treat and spreads rapidly and is unfortunately being seen with greater frequency in bearded dragons. 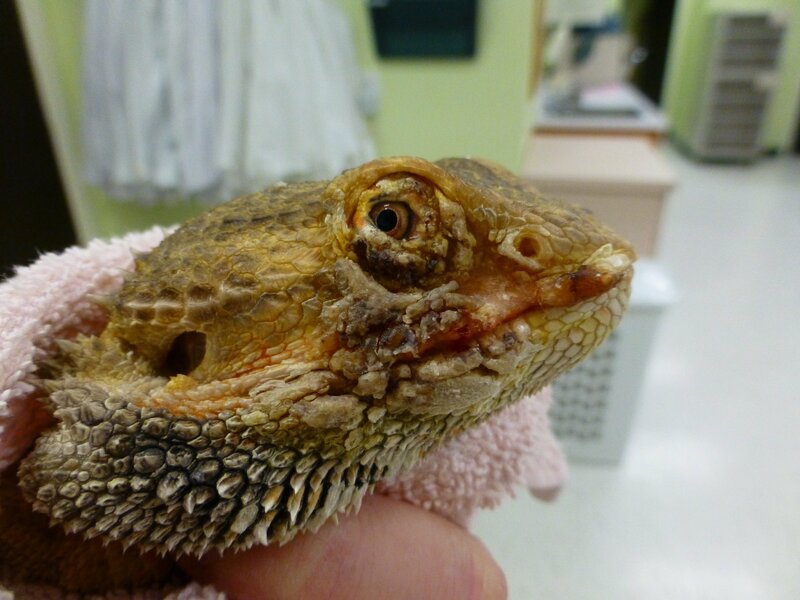 Any change to skin should be seen immediately and strict quarantine, especially of bearded dragons, should be practiced. 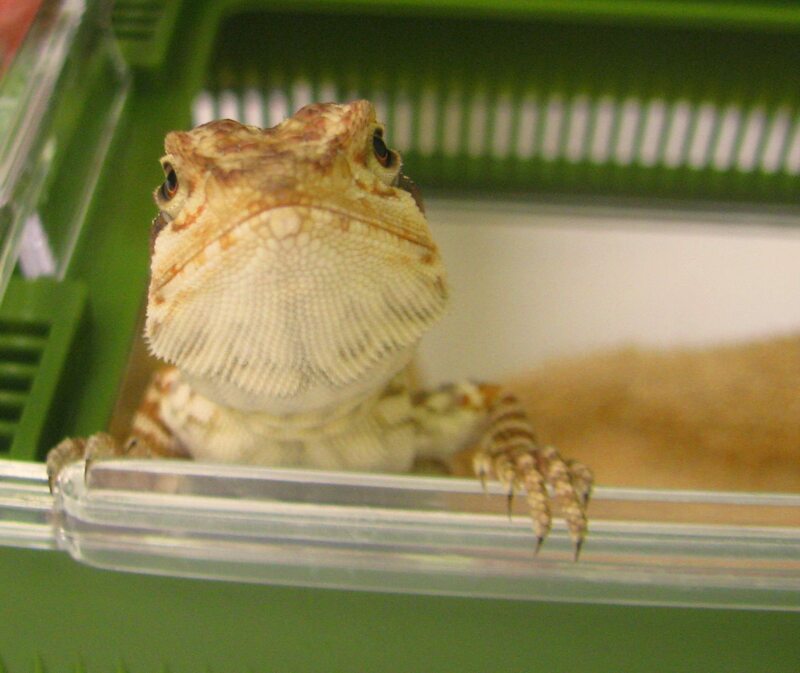 Adenovirus: Seen primarily in Bearded Dragons, adenovirus can cause inappetence, limb paresis, failure to thrive, diarrhea, lethargy and death. Diagnosis is challenging and there is no treatment other than supportive care. Quarantine of any new reptile helps prevent the spread of this disease. Public Health: All lizards may carry Salmonella. We recommend reading our handout on this zoonotic bacteria and taking the appropriate precautions. 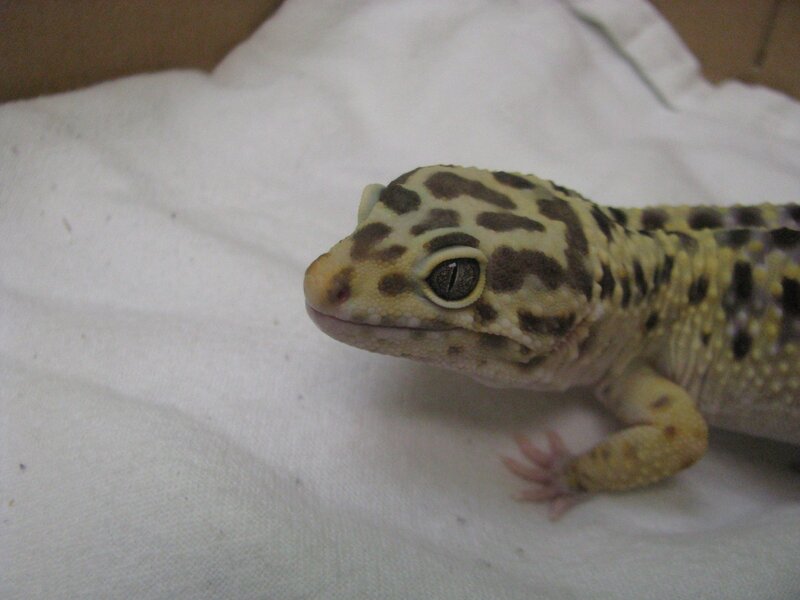 The Leopard Gecko makes a good starter reptile. It grows 8-9 inches and can live 15-20 years. This lizard has eyelids, but lacks the sticky feet to climb vertical surfaces. The large tail serves as a fat storage area and can break off with inappropriate handling or stress. Males have a series of well-developed pores ahead of the cloacal opening. Leopard geckos are nocturnal insectivores. Adults can be fed the occasional pinkie mouse. 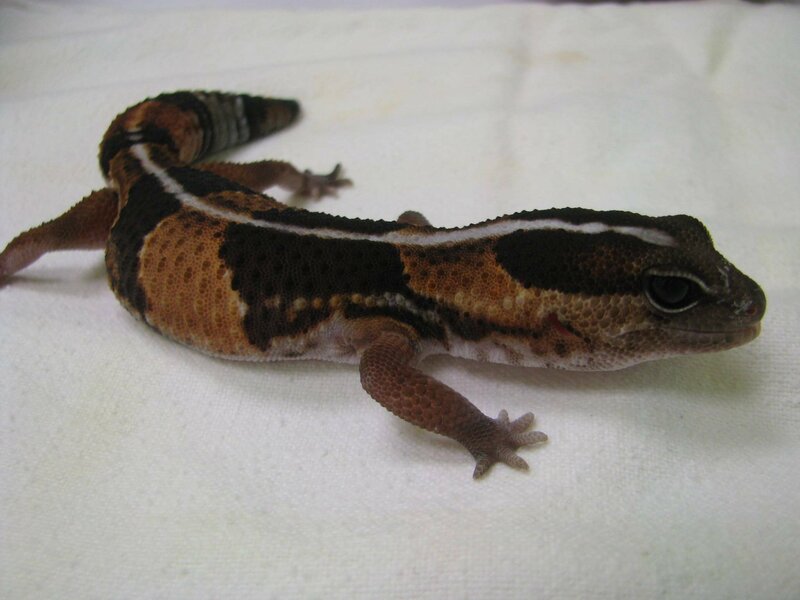 The Fat-tailed gecko is similar to the Leopard Gecko only shy and easily stressed gecko. This gecko needs several hide areas and is also a nocturnal insectivore. This lizard naturally eats small lizards and frogs, but can learn to eat large insects and baby mice in captivity. 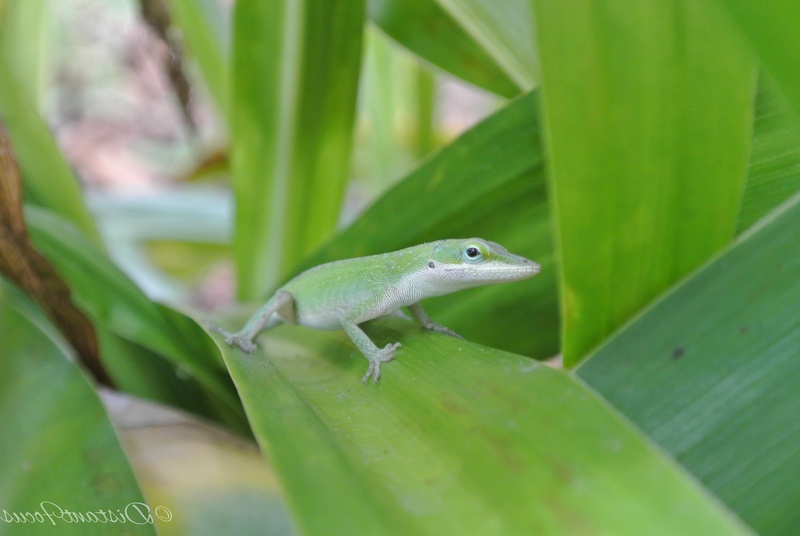 Green Anoles grow up to 20 cm in length. The males have a larger dewlap and may develop a bigger dorsal crest and developed pre-cloacal pores. The anole will change its green colour to a brown or black when stressed. Found in bushes, low trees and along rock walls, these territorial lizards bask on walls or branches. This is a diurnal (daytime), insectivore lizard. mouse or feeder fish to the adult diet. There are many sub-species of skinks. These sturdy, diurnal, territorial ground dwellers require lots of floor space in their enclosure. 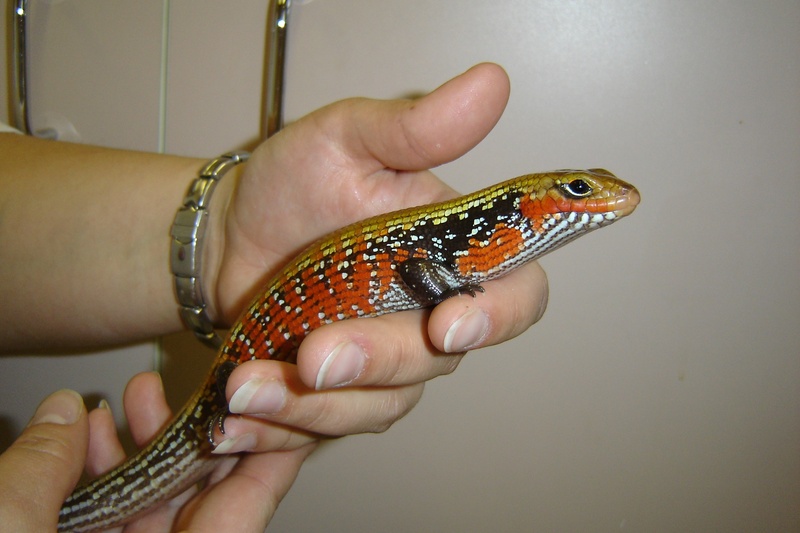 Skinks can be long-lived (up to 20 years). A large water bowl should be provided. Skinks are omnivores. 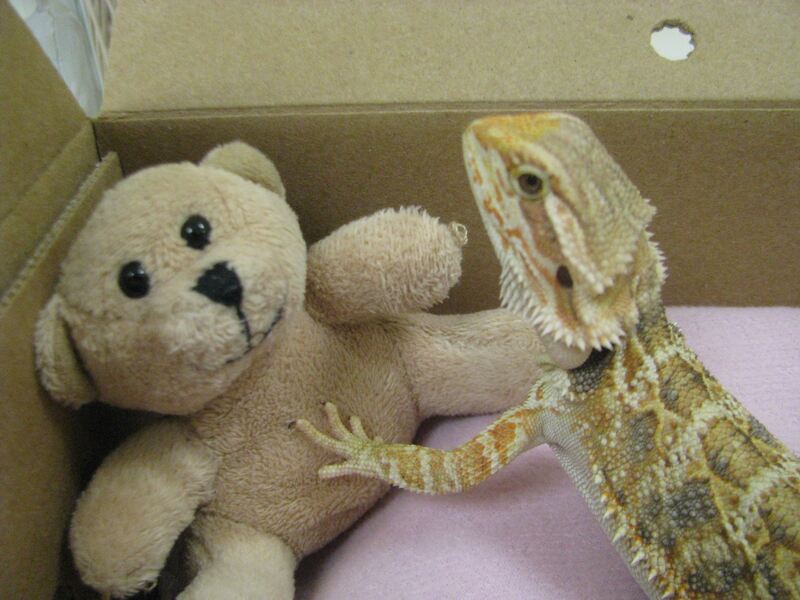 Bearded dragons have become increasingly popular as pets and are now available in a variety of morphs. They are diurnal lizards that bask in the morning and evening and seek underground burrows to escape the heat of the day. In the wild, they live in arid, rocky, semi-desert and arid open woodlands and are adept climbers on branches, logs and even fence posts. When threatened or stressed, they flare out their ‘beard’ that become black in colour. Mature males have wider and larger heads, larger pre-cloacal pores and a blacker beard. Bearded Dragons are omnivorous; they eat invertebrates, vertebrates, and forage for plant matter including greens fruits and flowers, which should be served moist. Baby dragons should only be fed very small prey during the first four months. Serious physical problems such as partial paralysis, seizures, incoordination and impaction have resulted from feeding large insects. Bearded Dragons require a generous amount of space in which to create the gradients of temperatures that they require and at least three thermometers should be placed throughout the enclosure. Temperature gradients should be both vertical and horizontal. An ultraviolet light sources should be offered for 12-14 hours per day. Bearded Dragons are especially prone to internal parasites, yellow fungus disease and adenovirus infection. Always quarantine a new bearded dragon. 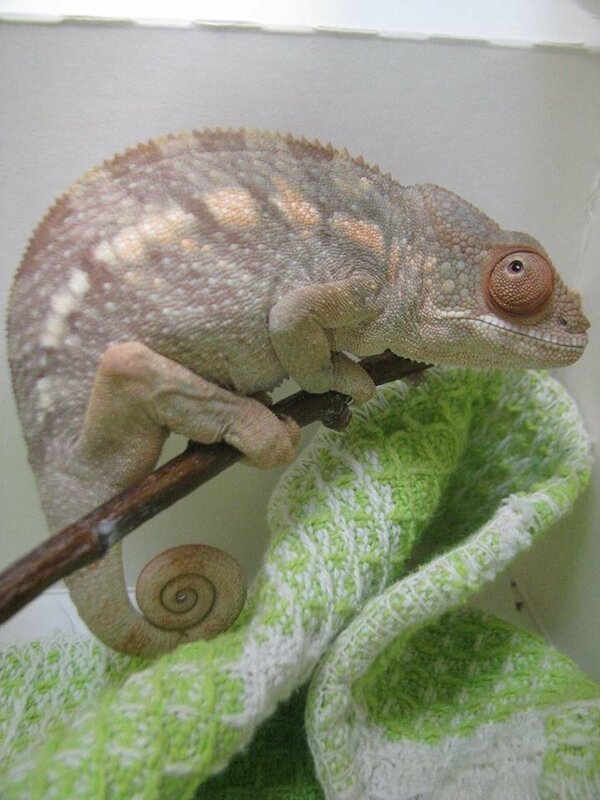 Chameleons can be difficult to keep and should be reserved for a more experienced herpetologist. A solitary, arboreal animal, chameleons should be kept singly with climbing vines and branches. Humidity is critical and often difficult to maintain in drier climates. Keepers must find the balance between adequate heat and humidity and enough ventilation to prevent bacterial and fungal overgrowth and screened rather than glass enclosures are recommended. Chameleons lay eggs and are insectivores, though larger animals may eat the occasional pinkie mouse, hibiscus blossom or other leafy green. 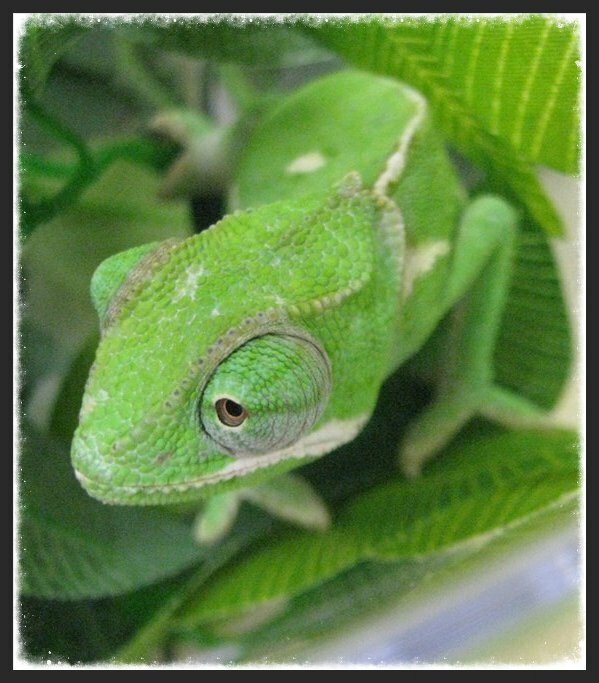 Because chameleons are arboreal, water is consumed by licking water droplets rather than from a bowl of standing water. The Uromastyx is a diurnal ground dwellers from a dry and rocky habitat. Enclosures should have large temperature gradients and deep substrate or burrow boxes. Diet is varied and comprised of an herbivore diet with the occasional insect and added seeds, such as alfalfa grass seed, safflower or small bird seed or sprouted lentils. Ultraviolet light should be offered 12-14 hours per day. Despite the minimal water and humidity requirements, captive Uromastyx should still be offered a small water dish and fed wet leafy greens. Iguanas spend their days basking, eating and then defecating. Despite the diminutive size of a baby iguana, males can grow to considerable size (6 feet in length and 9 kg) and are territorial, demonstrating with dewlap puffing, head swinging, and whipping their large and strong tail. Iguanas are arboreal and require large and tall enclosures and all these factors should be considered prior to purchase. 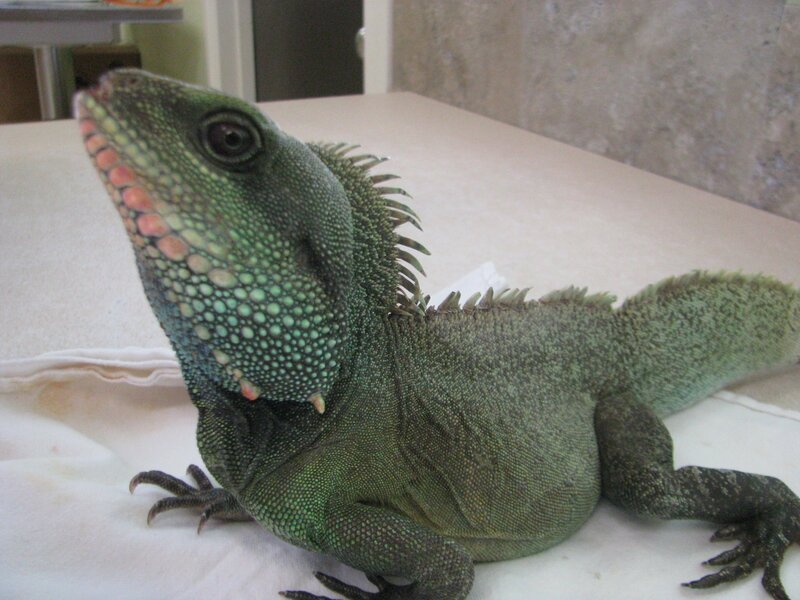 Iguanas are foliovores (eat primarily leaves and plants) and are capable of digesting high fiber diets. Feed from the herbivore diet recommendations. Iguanas are egg-layers and can live 15-20 years. Monitors are shy by nature and should be reserved for an experienced herpetologist willing to take the time and patience needed to habituate this large lizard. Savannahs range in size from 3-4 feet in length and grow rapidly, requiring large enclosures with lots of ground space, typically requiring specialty enclosures. 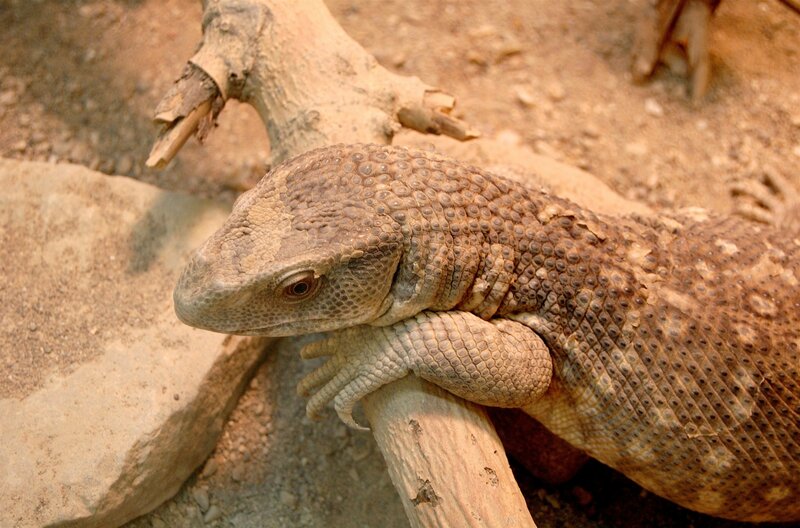 Savannah monitors come from hot and dry climates and require substrate that allows for digging long and deep tunnels. The diet shifts slightly as young become adults, but monitors primarily are opportunistic carnivores eating whole prey and adding insects such as crickets or grasshoppers to their diet. 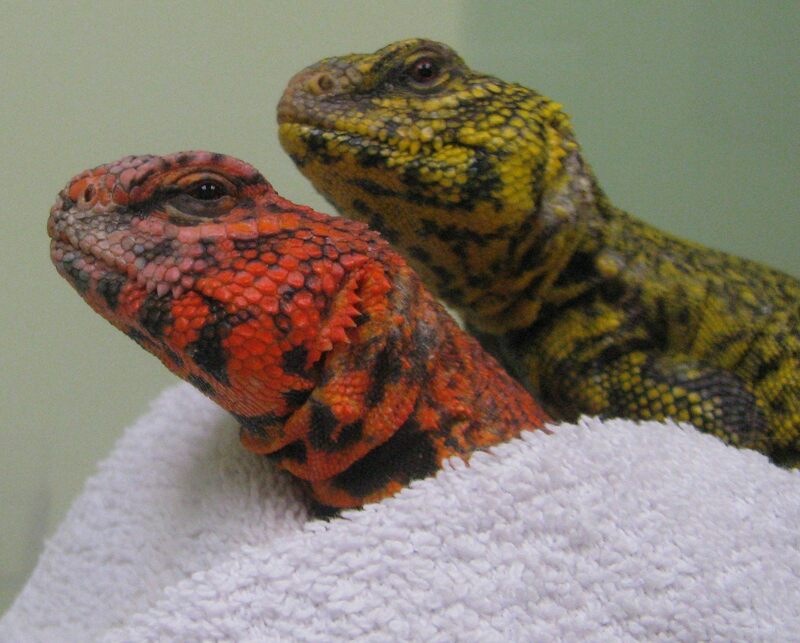 Savannah monitors can live between 10-15 years. Is your lizard not listed? Check out Melissa Kaplan at www.anapsid.org or Reptiles Magazine at www.reptilesmagazine.com for more information on the species you have. 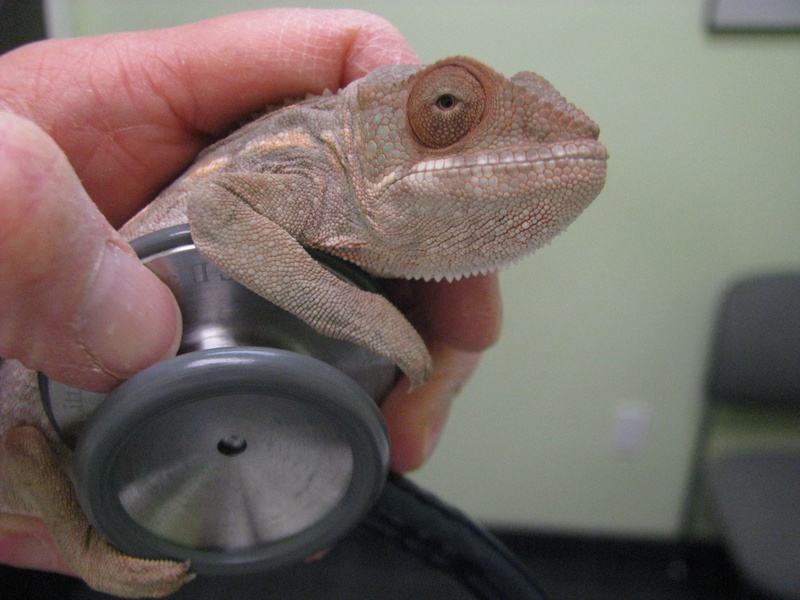 It is recommended that all lizards have a yearly health exam by a veterinarian experienced in the care of reptiles to aid in the early detection of any problems and to allow a chance to update owners on the latest in care and husbandry.